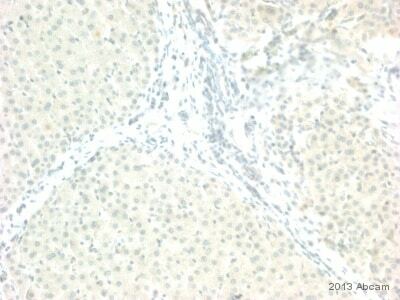 Rabbit polyclonal TGF beta 1 antibody. 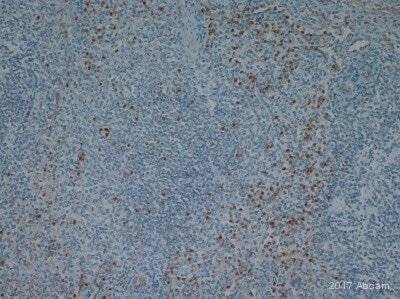 Validated in WB, IHC, ICC/IF and tested in Mouse, Rat, Human, Pig. Cited in 122 publication(s). Independently reviewed in 13 review(s). Full length, inactive 44 kD TGFB1 is cleaved into mature TGFB1 (13 kD). TGFB1 also homodimerizes and heterodimerizes with TGFB2, so there is potential for multiple different band sizes in WB. Synthetic peptide corresponding to Human TGF beta 1. Surrounding amino acid 374. WB: RAW 264.7 whole cell lysate (ab7187), Mouse 3T3 cell lysate. 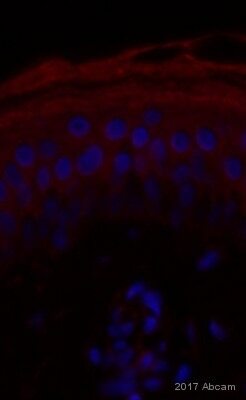 IHC-P: Mouse intestine tissue; human retina tissue. Our Abpromise guarantee covers the use of ab92486 in the following tested applications. WB Use a concentration of 0.5 - 4 µg/ml. Predicted molecular weight: 44 kDa.Can be blocked with Human TGF beta 1 peptide (ab231650). 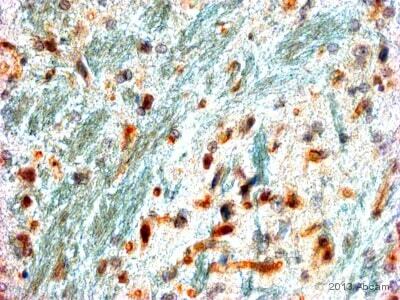 IHC-P Use a concentration of 10 - 20 µg/ml. 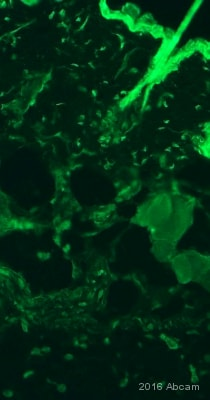 IHC-Fr Use a concentration of 10 - 20 µg/ml. Multifunctional protein that controls proliferation, differentiation and other functions in many cell types. Many cells synthesize TGFB1 and have specific receptors for it. It positively and negatively regulates many other growth factors. It plays an important role in bone remodeling as it is a potent stimulator of osteoblastic bone formation, causing chemotaxis, proliferation and differentiation in committed osteoblasts. Highly expressed in bone. Abundantly expressed in articular cartilage and chondrocytes and is increased in osteoarthritis (OA). Co-localizes with ASPN in chondrocytes within OA lesions of articular cartilage. Defects in TGFB1 are the cause of Camurati-Engelmann disease (CE) [MIM:131300]; also known as progressive diaphyseal dysplasia 1 (DPD1). CE is an autosomal dominant disorder characterized by hyperostosis and sclerosis of the diaphyses of long bones. The disease typically presents in early childhood with pain, muscular weakness and waddling gait, and in some cases other features such as exophthalmos, facial paralysis, hearing difficulties and loss of vision. The precursor is cleaved into mature TGF-beta-1 and LAP, which remains non-covalently linked to mature TGF-beta-1 rendering it inactive. 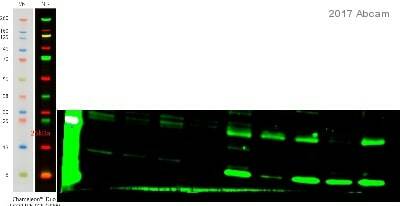 Western blot of mouse 3T3 cell lysate with ab92486 at a concentration of 4 µg/ml. 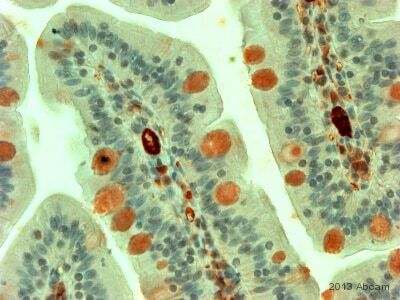 ab92486 staining TGF beta 1 in Mouse intestine tissue sections by Immunohistochemistry (IHC-P - paraformaldehyde-fixed, paraffin-embedded sections). Tissue was fixed with paraformaldehyde and blocked with 5% BSA for 30 minutes at 20°C; antigen retrieval was by heat mediation in a citrate buffer. Samples were incubated with primary antibody (1/100 in blocking buffer) for 24 hours at 4°C. An undiluted HRP-conjugated Human anti-rabbit polyclonal was used as the secondary antibody. 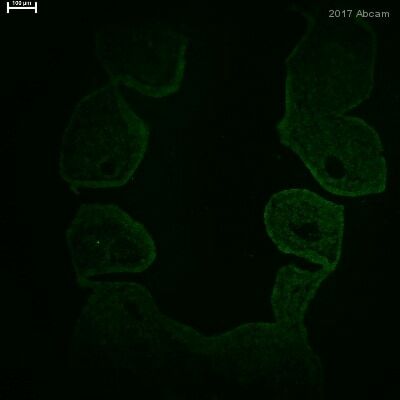 ab92486 staining TGF beta 1 in Human retina membrane by Immunohistochemistry (IHC-P - paraformaldehyde-fixed, paraffin-embedded sections). Tissue was fixed with paraformaldehyde and blocked with 10% serum for 30 minutes at 20°C; antigen retrieval was by heat mediation. 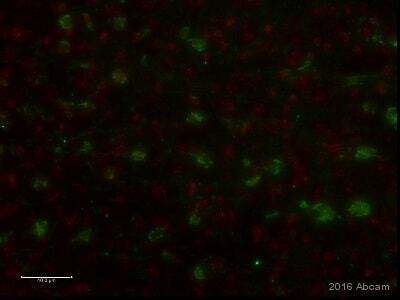 Samples were incubated with primary antibody (1/400 in PBS + 1% Triton X-100 + 2% goat serum) for 24 hours at 4°C. An HRP-conjugated Human polyclonal was used as the secondary antibody. Publishing research using ab92486? Please let us know so that we can cite the reference in this datasheet.